Winner Poker allows you to play all of your favorite poker games in a fun and safe environment. The games are certified by Technical Systems Testing (TST) and the poker room is licensed in Antigua and Barbuda. They offer multiple poker variations and round the clock tournaments. Winner Poker is powered by the online gaming software provider, Playtech. Play is available in multiple languages including English, French, German, Spanish and Swedish. Players can choose from a number of variations of poker, including Texas hold’em, Omaha, Omaha hi-lo, five card stud and seven card stud. Within each game there are subcategories, for example, Texas hold’em comes in pot limit, no limit and fixed limit games, as well as turbo, heads up and fun tables. The poker room provides useful information for its players including house rules and a glossary. It also explains poker features and poker hand ranks. Players are able to play at eight tables simultaneously. Players are able to chat with each other. 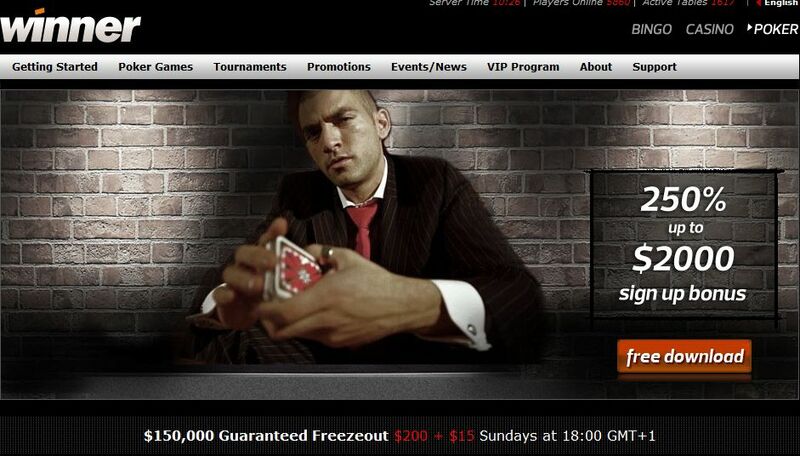 There are also many tournaments available at Winner Poker. Players can choose from guaranteed prize tournaments, freerolls, multi table and single table tournaments, satellite tournaments and more. Currently, players can join the ECOOP IV, WSOP Warrior League and the Irish Winter Festival. New players are eligible for a 100% match deposit bonus up to $200. If you refer friends to Winner Poker, you will be awarded with $10 for the first friend that you refer who makes a deposit, $15 for the second friend that you refer who makes a deposit and $25 for the third friend that you refer who makes a deposit. There are a number of promotional tournamentsthat players can participate in. These include the ECOOP IV with a guaranteed prize pool of $5,100,000, the chance to win a seat to the WSOP 2010 Main Event, the Top 30 race which will award huge cash prizes to players who finish in the top 30, plus daily sit ‘n’ go challenges that are awarding $100 a day. Players are also able to take part in the Fort Knox Jackpot, Rio Jackpot, Maui Jackpot and Dirty Dozen Jackpot. There are regular $250,000 guaranteed prize tournaments and twelve daily $25 freeroll tournaments. 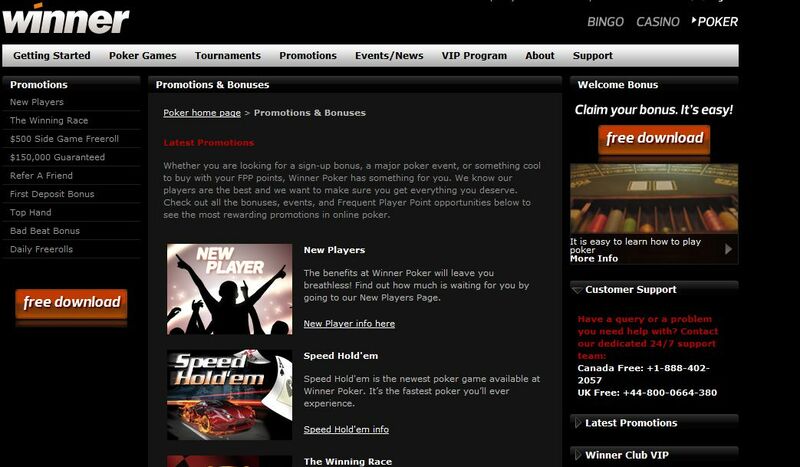 Winner Poker runs a VIP program with multiple tiers. Players can earn points according to each raked hand they participate in and the more points you accumulate, the higher you move in the program. VIP members qualify for special benefits including the monthly pending bonus, VIP races, freerolls and merchandise from the Winner Shop. If you have any queries when playing at Winner Poker you can contact their customer service team which is available 24 hours a day, seven days a week. They can be contacted via email, telephone, fax or instant live chat through the poker software itself. Players can make deposits using a number of different methods. These include ClickandBuy, Click2Pay, EntroPay, iDEAL, InstaDebit, Moneybookers, NETeller, Paysafe Card, Ukash, WebMoney and bank transfer.